is Australia’s most innovative materials handling specialist. We help our manufacturing clients move materials and products around their production facility and around the world. ICA’s custom engineered conveyor systems move raw materials, processed materials and finished goods from mine site to processing facility, around the production line and from the factory to the final destination. Materials handling technology specialist Industrial Conveying (Aust) Pty Ltd have released a noise reducing portable sound enclosure. The innovative world-first relocatable acoustic enclosure can be deployed anywhere in a moment’s notice.Originally purpose-built and designed for a mining drill rig, the enclosure is an ideal solution for disaster areas and emergency response teams who need to get out of the elements, or for construction companies requiring 24×7 operations.Transport stillages have been custom-designed to store and transport the enclosure safely and effortlessly.The enclosure can be totally flat-packed and easily transported onto standard truck and container configurations. Clipped together with minimal fasteners ensuring fast, user-friendly installation, for set up anywhere!.The relocatable acoustic enclosure can be situated on any surface that does not require completed foundations. It is an engineered structure, referencing a traditional barn exterior that does not dominate its surroundings or call attention to itself.ICA also took into consideration the interior environment required for optimal functionality of equipment housed within the enclosure, as well as the operation team’s health and safety needs.The beauty of the engineered structure is that there are no columns inside; the pitched roof is of versatile height to accommodate any machinery requirements.Once inside the space, there is an expanse of area to enable a client to manoeuvre drills and other equipment. Creating a hospitable environment that crews can work in for long hours under any conditions.Industrial exhaust fans move air through the structure and control air conditions, ensuring the optimal function of the machinery. When used in mining air movement is essential should the drill hit any pockets of gas. Fresh air is supplied into the structure ensuring the health and safety of the drill rig operations team.Air conditioning is ducted across the roof of the structure. 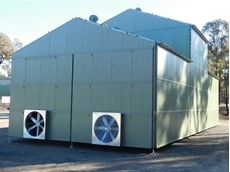 The cooling unit is detached from the enclosure, connected via flexible ducting for easy installation depending on the needs of the drilling site.The key feature of this innovative world-first design is the dramatic reduction of the amount of sound that is heard from a drilling rig during 24-hour operations.It is easily installed in both rural and urban terrain, accommodating slopes and unstable surfaces. A dock is utilised for the quick and efficient loading/unloading of product to and from trailer or container units.Automated dock loading and unloading systems are materials handling solutions that load or unload trucks and trailers automatically by using different kinds of conveyors, rollers, skates, docks and drives. Automated dock loading and unloading usually requires two systems: a system in the trailer and a system inside the dock. 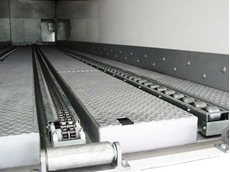 When the trailer is positioned at the dock, the entire load is loaded or unloaded automatically.These systems are an essential component of a smooth and profitable logistics system and can be integrated into warehouse management systems, automated guided vehicles and production lines.Skate Dock from ICA Associated with profiled floors in trailers and containers. Removes the need for equipment associated with the logistics (trailer/container) component. Can be configured with both chain and slat arrangements for association with delivery/receivable conveyors. Generally, associate with a hydraulically activated levelling unit. The skate is essentially a finger which is extended/retracted into/out of a container/trailer and has airbags to raise or lower for integration within a profiled floor. ICA manufactures equipment to automate the handling of food and beverage air catering carts between flights. This system can be sold as a complete solution or in segments, which when integrated form the whole turnkey solution.One of ICA’s previous projects involved an iconic Australian airline company, who commissioned a Queensland construction firm to build a new air catering facility as part of its multi million-dollar airport upgrade. This multifaceted project was a complex process, so the construction firm commissioned Industrial Conveying (Aust) Pty Ltd (ICA) to design and manufacture some of the specialised components that facilitate the handling of food and beverage carts as they pass through the facility.ICA custom designed and manufactured a system that automates the handling of food and beverage carts in between flights. The facility tracks, receives, unloads waste, washes, loads and redeploys airline catering carts according to the requirements of each carrier, aircraft type and catering requirement.ICA’s custom-designed equipment accommodates the different physical dimensions, wheel alignment and centre of gravity for each cart.Operational Advantages Increased Efficiencies – Higher throughput, reduced processing time, less human intervention. Better control over meal cart movements Capacity to handle 160 carts per hour, 1200 carts per day Reduced incidence of OH&S issuesFresher food for consumers – Speedy processing and handling allows meals to be prepared closer to departure times. 01/12/18 - Materials handling systems specialist Industrial Conveying (Aust) Pty Ltd introduces an innovative range of relocatable acoustic enclosures designed for deployment anywhere at a moment’s notice. Originally designed and purpose-built for a mining drill rig, the new noise reducing portable sound enclosure is an ideal solution for disaster areas and emergency response teams who need to get out of the elements, or for construction companies requiring 24×7 operations.“Our aim is to understand our client’s requirements and respond to their specific needs,” says ICA Chief Operating Officer, Bruce Granger. “We work very closely with all our clients to achieve this. Our speciality is our capability to deliver a total turnkey solution.”Key features of the new noise reducing portable sound enclosures include flexibility to be placed on any surface that does not require completed foundations; engineered structure, referencing a traditional barn exterior that does not dominate its surroundings or call attention to itself; and flat packed for easy transportation from location to location, clipped together with minimal fasteners ensuring fast, user-friendly reinstallation. “It’s like a meccano set, with clear instructions and easily handled parts labelled to piece together quickly, yet adaptable to any location,” says Bruce.Transport stillages have been custom-designed to store and transport the enclosure safely and effortlessly, and it is possible to pack the enclosure onto standard truck and container configurations for setup anywhere.The new portable sound enclosures are proven to dramatically reduce the amount of sound heard from a drilling rig during 24-hour operations. 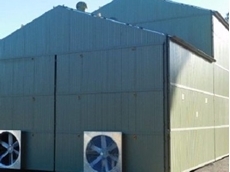 It is easily installed in both rural and urban terrain, accommodating slopes and unstable surfaces.For a recent project, Industrial Conveying (Aust) Pty Ltd understood the full functional needs of the client, and delivered a portable sound enclosure that included industrial fans to ventilate the drill rig and control air conditions, ensuring optimal function of the machinery; exhaust fans to move air through the structure and help deal with gas pockets during drilling; fresh air supply into the structure for the health and safety of the drill rig operations team; and ducted air conditioning across the roof of the structure with the cooling unit detached from the enclosure, and connected via flexible ducting for easy installation depending on the needs of the drilling site.ICA also took into consideration the interior environment required for optimal functionality of equipment housed within the enclosure, as well as the operation team’s health and safety needs.The engineered structure has no columns inside, and the pitched roof is of versatile height to accommodate any machinery requirements. Once inside the space, there is an expanse of area to enable a client to manoeuvre drills and other equipment. All of these features create a hospitable environment that crews can work in for long hours under any condition. 25/11/18 - Outsourcing supply chain management and logistics may bring efficiency gains to a company; however, many businesses tend to overlook their own premises and perhaps are operating with a low level of internal handling efficiency.Materials handling specialist, Industrial Conveying (Aust) Pty Ltd – ICA, has studied the whole materials handling spectrum and found two main areas in which transporting and handling goods can return optimum efficiency, especially when working with pallets.Firstly, it is important to completely integrate the materials handling system to maintain product flow. Additionally, the company should use their contract transport service as a de facto warehousing component.Plant managers are now conscious of reducing the duty cycle of palletising systems and they want the best technology urgently. 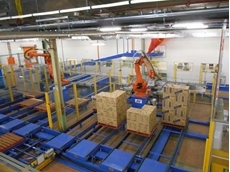 By combining pallet technology with innovative engineering, Australian businesses can now be provided with a turnkey palletising solution for any requirement.One or a combination of ICA’s multiple technologies can be integrated with a client’s sorting system so that it can operate a multiple product palletising system. This means supply can be made on an as-needed basis using a dedicated palletising system that can include anything from fixed machines, conveyors and lifting equipment all the way through to robotic systems.Furthermore, by utilising an extensive range of standard dedicated palletisers, ICA’s engineers are able to efficiently develop ideal solutions to any palletising challenge.Companies that have studied the logistics market and see the positives of utilising transport and freight services to eliminate costly warehousing and speed up truck turnaround times are smart operators. Key to this is knowing exactly how to set up loading and unloading systems to work in synchronicity with transport company services.Until recently, operations managers have been content to receive stock through an incoming goods dock, store it temporarily while organising transport to its client, and then eventually send it again on another truck.This has been occurring in virtually every industry including perishables, food and beverage, engineering, mining, agricultural and rural, primary industry, retail and consumer products among many more.However, with an optimised materials handling system in place, smart companies, instead of storing stock on the premises for an indefinite period, rarely have to see their goods. Instead, they use a clever materials transfer system on their site that instantly moves goods from incoming to outgoing without storage, or they have equipped their transport carrier with appropriate systems to load and unload palletised or non-palletised product and transport it directly to their clients without warehousing.This approach is improving supply chain standards and eliminating double handling and storage time that costs business in so many ways. Warehouse storage costs money, therefore, the elimination of reliance on warehousing is an automatic and enormous cost saver for the company.Reduction in multiple handling of stock also reduces time and operating costs and ensures smoother movement of product from manufacturing base to the customer. In the case of perishables, reduction in supply chain steps can only be of benefit to handlers of product with limited shelf life.ICA’s involvement in this type of materials handling solution was sparked by a growing call from industry that warehouse consolidation alone does not adequately reduce running costs. 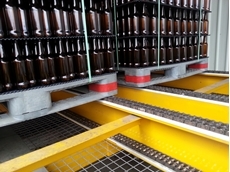 A step had to be taken out of the materials handling sequence to provide a leaner level of operation for many Australian companies.This has allowed ICA to develop fixed and purpose-built systems for a demanding market serious about making transport systems a de facto storage solution.ICA has developed several turnkey projects for Australian companies including: Automated transport loading and unloading systems (handling unit or complete truck loads);Pallet handing systems such as multi-lane palletising equipment, to organise truck loads ready for dispatch;Elevators and spiral conveyors for non-palletised goods transfer between different floor levels, powered roller conveyor and lift tables.For more information, please visit the IndustrialConveying (Aust) Pty Ltd website. 18/11/18 - Materials handling specialist Industrial Conveying (Aust) Pty Ltd is making their presence felt quite strongly in the Australian beverage industry. ICA’s increased presence in the beverage handling sector has been facilitated by a series of strategic acquisitions, amalgamations and collaborations with product specialists, all supported by an Australia-based engineering centre delivering world class solutions.Australia’s beverage sectors include the dairy industry, soft drinks manufacturing and handling, confectionery, wine, beer, spirits, and any other segment that requires design and implementation of handling solutions to suit specific needs.Australia’s beverage industry is witnessing a spike in demand from local and global consumers who want to get a taste of the quality wines, beers, spirits, mixed drinks and dairy products that are produced locally to the highest quality standards. ICA’s materials handling solutions are in demand not only in Australia but also across the world.ICA’s growth is driven not just by the continuous improvement in high technologies but also because of a strong domestic presence and reputation to deal directly with clients while co-operating with industry innovators on projects. The beverage industry is a high output segment and often deals with perishables, so the solutions required can be urgent and need to be of extreme engineering accuracy to achieve the most productive output.The company’s turnkey capabilities have continued to develop with multiple staff in Melbourne and Bendigo offices and investment in the latest Emulate3D software. During the design phase, an ICA draftsperson works with the client to configure and simulate a purpose specific system. 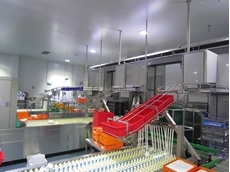 This allows the concept to be explored, and provides the opportunity to identify and resolve problems in the early phases of the project.The combination of the Melbourne office and the Bendigo design, project management and engineering teams has placed ICA in a position where almost any product can be supplied as purpose specific and integrated into an overall materials handling system with any of the company’s standard food and beverage handling products.Standard technologies typically include knife edge conveyors, 90°/180° modular belting type conveyors, plastic modular belt type conveyors, and slat band conveyors.ICA also designs, programs, installs and commissions control systems and automation platforms for these materials handling projects, making them IoT and industry 4.0 ready for future expansion.Similar to how ICA’s solutions have benefited the food processing, mining and quarrying sectors, the beverage industry now has access to a one-stop shop for world-class materials handling systems.ICA’s solutions can be tailored to the specific requirements of projects and clients of any size, and include dock loading/ unloading; warehousing and distribution; belt conveyors; pallet conveyors; roller conveyors; and materials handling equipment. 11/11/18 - Industrial Conveying (Aust) – ICA can help facilities completely overhaul their outdated materials handling systems with very little disruption to their operations.Thanks to a modern developed material handling solution from ICA, companies operating distribution centres and working with manual handling systems for a large quantity of small items can now overhaul their system while achieving efficiencies with time and cost.ICA’s solutions allow companies to modernise processes without putting themselves through a costly and logistically challenging relocation. 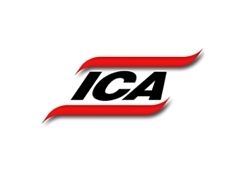 Product importers and exporters handling huge quantities of stock manually will particularly benefit from ICA’s solutions, which can bring their current materials handling systems up to speed.ICA designers and engineers have the expertise to create unique solutions for challenging applications. For instance, if the floor space is limited, ICA’s designers can configure the new set-up to provide even more space. By installing a large part of the materials handling system in the ceiling space, ICA enables the client to continue operating in the same premises without having to relocate or build a new factory. When the ceiling space is utilised for the installation, less equipment will occupy the floor space, making the plant more spacious than before. Worker safety is also increased with a lesser number of obstacles on the floor.ICA engineers work very closely with clients to design, commission and complete the new materials handling system installation using a combination of conveyor systems, carousel sorting technology, and labelling and RFID technology.Ideally, the client gains a new system that remains in the same location without any disruption whatsoever. 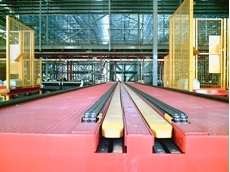 Companies can remain competitive without the need to expend resources looking for, or building, new premises just because they want to update their sorting systems or expand their production lines.Roller conveyorsPowered roller conveyors are used for moving, sorting, diverting and transporting products at low or high speeds. These include powered roller, chain driven/ belt driven, zero/ low pressure accumulation, and gravity conveyors.Belt conveyorsRegardless of your unit load or bulk material capacity, ICA can design a belt conveyor for horizontal, incline or decline paths and at a predetermined rate. 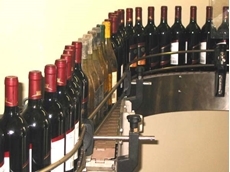 ICA delivers standalone belt conveyors or solutions integrated with a turnkey project. Options include straight or flat belt conveyors, telescopic, troughed, carousel picking conveyors and modular belt/ slat conveyors.